Visualization of big data assists in studying changes in oxygen and temperature dynamics over seasons and years. The time series graph above was created by doctoral student Rachel Pilla and junior Donna Nguyen (photos courtesy of Pilla). Donna Nguyen, a junior economics and statistics double major from Ho Chi Minh City, Vietnam, is used to working with spreadsheets full of data points. But she is new at ecological data collection in the field. 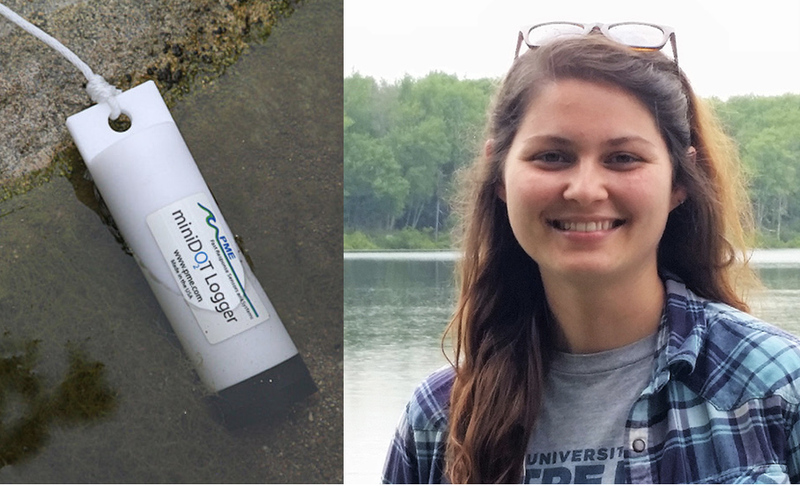 As an Undergraduate Summer Scholar, she is getting hands-on experience — and a deep dive — into collecting high-frequency data from several lakes in Pennsylvania’s Pocono mountains. Located in Lacawac Sanctuary, Lake Giles and Lake Lacawac are part of Miami’s Center for Aquatic and Watershed Sciences. 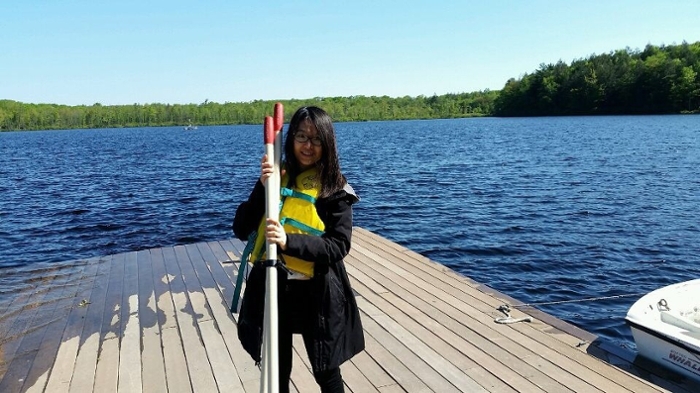 Besides having one of her favorite college experiences so far — canoeing Lake Lacawac at sunset — Nguyen developed a firsthand appreciation for the research data she analyzes. She is mentored by Craig Williamson, Ohio Eminent Scholar of Ecosystem Ecology and professor of biology, and his doctoral student Rachel Pilla. “Seeing Rachel dive into the waters to pull up the miniDOT data sensors (it was 50 degrees and the Loch Ness myth has never really been dispelled), I realized how hard it could be for (ecological) data to be acquired in the first place so that analysts like me can draw insights from it,” she said. Rachel Pilla on Lake Lacawac; miniDOT sensor. The underwater sensors are deployed year-round to log dissolved oxygen and temperature data every 15 minutes. The resulting big data files will be used to compare effects of the mild winter of 2016-2017 and the colder winter of 2017-2018. Preliminary analyses suggest that Lakes Lacawac and Giles were frozen for several weeks, followed by an anomalous midwinter ice thaw, followed by refreezing, to complete ice cover less than a month later, Nguyen said. 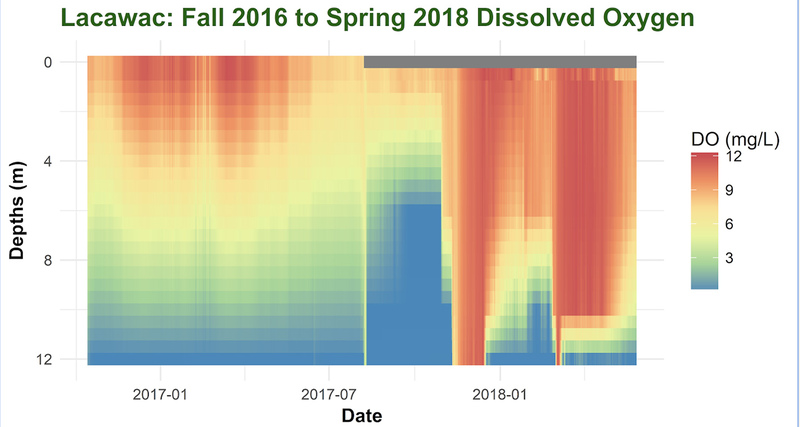 “Based on this interesting observation, we are investigating the significant changes in oxygen dynamics in winter that can lead to 'legacy' effects in the lakes in spring and summer," Nguyen said. Nguyen prepares for data collection on Lake Lacawac. 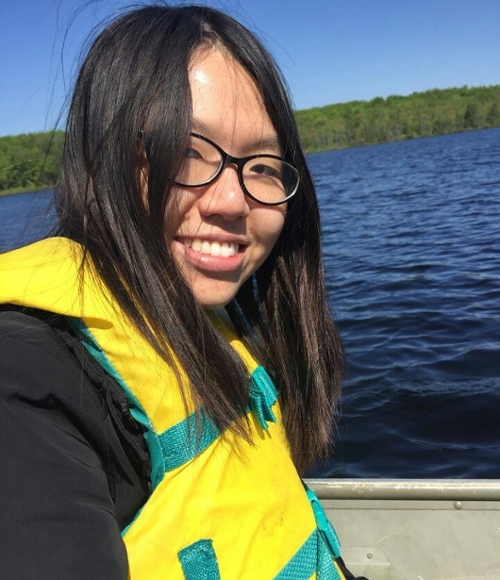 Nguyen was matched with Williamson’s Global Change Limnology Lab last year when she applied for a Research Experience with the new Miami Ecological Big Data Initiative (MiEBDI). Working with Pilla, Nguyen learned not only about ecological data, but also new analytical techniques for time series data, she said. She also worked with Thomas Fisher, associate professor of statistics, to devise simulation-based models for air temperature and precipitation input for Pilla’s Global Temperature Sentinels project. The project, which Pilla co-leads, has compiled the world's largest dataset of long-term vertical temperature profile data for more than 150 lakes across the globe. “I am grateful for the MiEBDI experience for the chance to apply my statistics background and create data visualizations” for the project, Nguyen said. Read more about Rachel Pilla’s research. Nguyen and Pilla received a Doctoral Undergraduate Opportunity Scholarship (DUOS) last spring for their research project. Administered by the office of research for undergraduates, the scholarship provides up to $1,000 in funding. Thanks to the mentorship of Williamson and Pilla, Nguyen has become more confident and proficient in her skills translating insights to people from different fields, she said. Williamson nominated Nguyen for a scholarship to attend the Grace Hopper Celebration (GHC) this September. 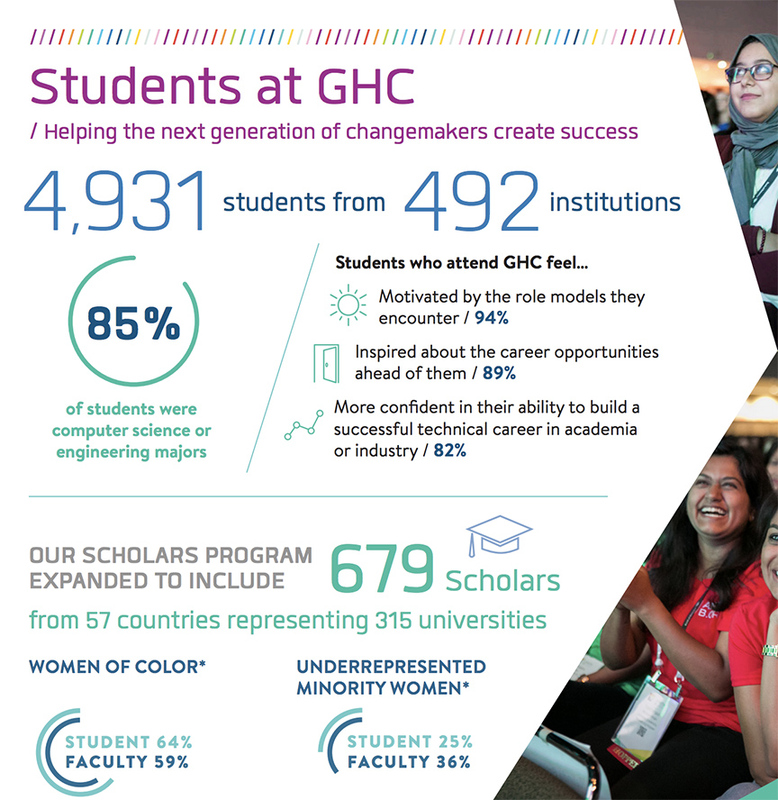 The GHC is the world's largest gathering of women technologists. Last year, more than 18,000 attendees from 81 countries, including nearly 5,000 students from 490 institutions, broke attendance records for the conference. She won an all-expenses-paid GHC Scholarship Grant to attend the three-day conference in Houston, Texas. She is the second Miami student to receive this scholarship (Nora Husani, Miami ’16, was the first). Nguyen was a member of Miami’s Scholar Leader Program last year and will return this year to advise one of the program’s clusters. USS program: Administered by the office of research for undergraduates (ORU), up to 100 students are selected each summer for the award. It provides a $2,600 fellowship, $400 project expense and tuition waiver for 6 credit hours of independent study credit to conduct faculty mentored research.